Desert theme has a pure design, with a lot of customizing options. 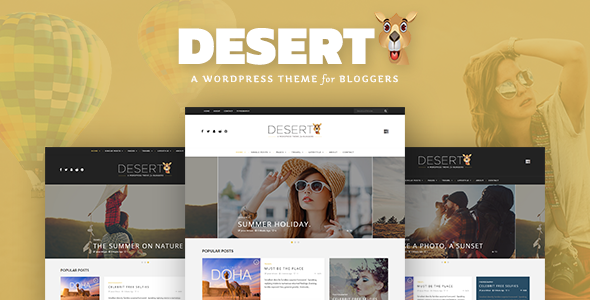 Desert supports can be used as a full-width blog or with left or right sidebar, powered by beautiful widgets. Based on the Bootstrap 3.0 grid, the theme has a nice look on tablets and mobile devices. SEO base already built-in with rich snippet microdata for article, The theme also compatibles with popular SEO plugin ie: All In One SEO, Yoast SEO plugins. Featured area is very flexible: allows you can select what queries you wish: categories, tags, the number of posts, post offset, popular comment, popular view, top review, post type, random, author? Advanced Page/Post Options: Page and Post options are individual per page or post meaning they only affect the page or post you set them on. They will override theme options which allow you to have a unique page or post outside of your global settings. Popup image as a gallery when click on. Advanced Categories Options: the theme allow you can control each category as layout and sidebar. Advanced Block Styling: The theme allows you can control elements of block listing layout. Advanced theme options: The theme builds in with Redux Framework and comes with 100+ Theme Options with hope to help you customize any elements of your site without code knowledge. Customize your website couldn’t be easier. Custom post widgets: This is a powerful widget to listing posts, including 2 layouts, many types of queries: categories, tags, post offset, popular by view, comments, best reviews, post type, author, random? You can contact us via the support tab of this item or send an email us at: skythemes68@gmail.com. We will reply you as fast as possible. 3. And other improvements and minor bug fixes. 1. Improved: color option for the main theme. 2. And other improvements and minor bug fixes.